My companion(s) ate: falafel burger; Giraffe burger; salmon and smoked haddock fishcake. And for dessert my boyfriend ordered a rocky road sundae. 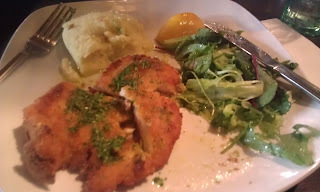 The food was: My chicken schnitzel was very nice; it came with a garlic and herb butter and a rocket salad and the mashed potato was very fluffy. The falafel burger went down very well with the vegetarian in our group; it comes with grilled pepper, houmous, beetroot, rocket, halloumi cheese, tzatziki and harissa so a bit more interesting than your usual burger! The Giraffe burger itself isn't that unusual; a beef burger with bacon,m cheese and all the usual trimmings, but it was pronounced very tasty. The fishcake was a good size and my friend who ordered it was very pleased with it. 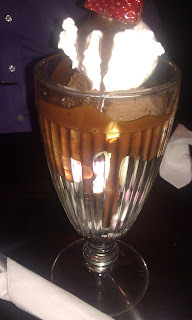 The Rocky Road Sundae (see photo) was huge; it had a base of chocolate brownie, with marshmallows and chocolate and vanilla ice cream and warm chocolate sauce over the top. It's ideal for sharing. The atmosphere/service was: very good. One of my group wanted a main course that only appeared on a two-course set menu, rather than the main menu, but only wanted the one course. The waitress was happy to oblige and I believe charged a reduced price from the set menu cost. The restaurant was quite busy but we didn't have to wait long for our food, which was good as I only had an hour before I had to be on stage for my choir concert! Price range/value for money: Good value - nothing is that expensive and the portion sizes are generous. Would I recommend it: Yes, I've been back a few times; they have a lot of choice on the menu to cater for all tastes and the food is good.